Sign Up for Monthly Updates! California farmers can grow more food and fiber with less water, according to the Pacific Institute report, More with Less: Agricultural Water Conservation and Efficiency in California – A Special Focus on the Delta. The report offers a comprehensive analysis of how to maintain a strong agricultural economy while improving the efficiency of water use and reducing groundwater overdraft and water withdrawals from the critically threatened Sacramento-San Joaquin Delta. The study finds agricultural water-use efficiency can be improved through careful planning, adopting existing, cost-effective technologies and management practices, and implementing feasible policy changes. The report also provides recommendations to overcome some of the financial, legal, and institutional barriers that can hinder farmers from implementing such adaptations and investments. 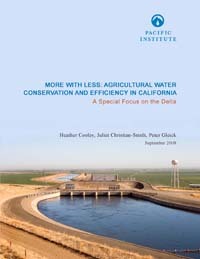 Funded by the David and Lucile Packard Foundation and the William and Flora Hewlett Foundation, this report is the first part of a larger effort to determine the potential for agricultural water efficiency statewide, to be released early 2009.